The Dolomites region in Northern Italy is a mountain region of sheer natural beauty. I have not been there often but last summer I visited it for the first time. It is in the South Tyrol area of Italy where German is widely spoken. I covered the area from a hiking and scenery point of view. For those food lovers it’s a must visit. I was so impressed with it all that I had to revisit the area and its food again in winter. 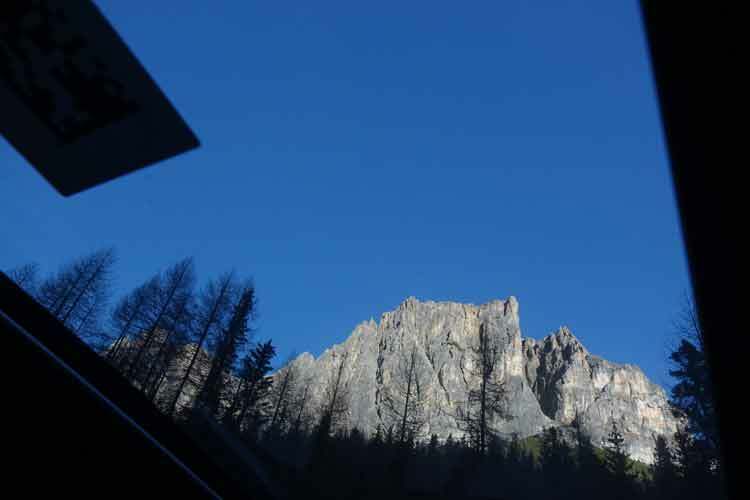 This time I focused on the Alta Badia area which is famous for its skiing in Corvara where one of the world cup runs take place. I was going to cover the Gourmet Skisafari, which was a day of skiing with Michelin starred food served in 5 different mountain huts. 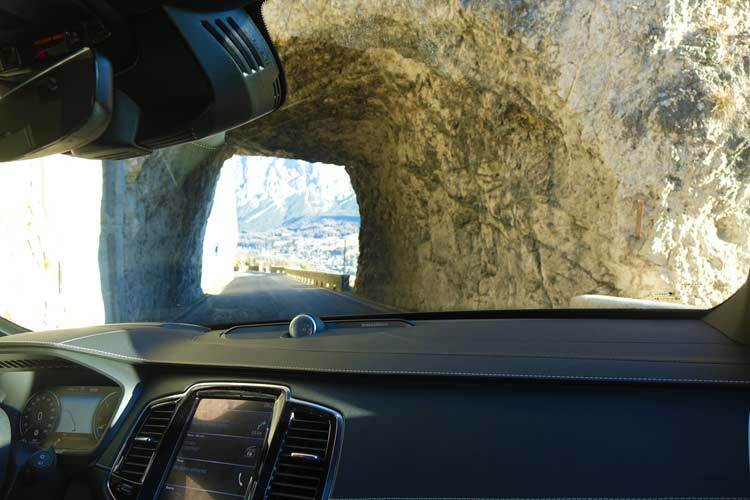 The Dolomites region is one of the richest areas in Italy and a perfect place to showcase a luxury car. 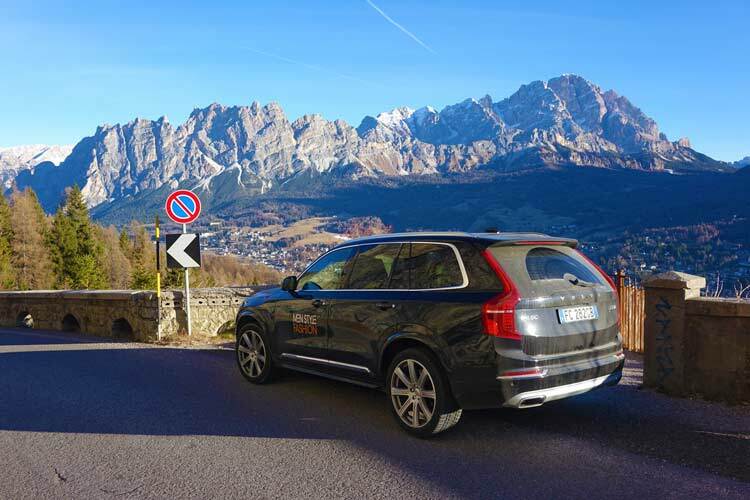 Thanks to Volvo UK, I was given a Volvo XC90, my journey began from Treviso airport. In 2015 Volvo launched its second generation XC90, a much needed launch as its hugely successful first generation was launched in 2002. 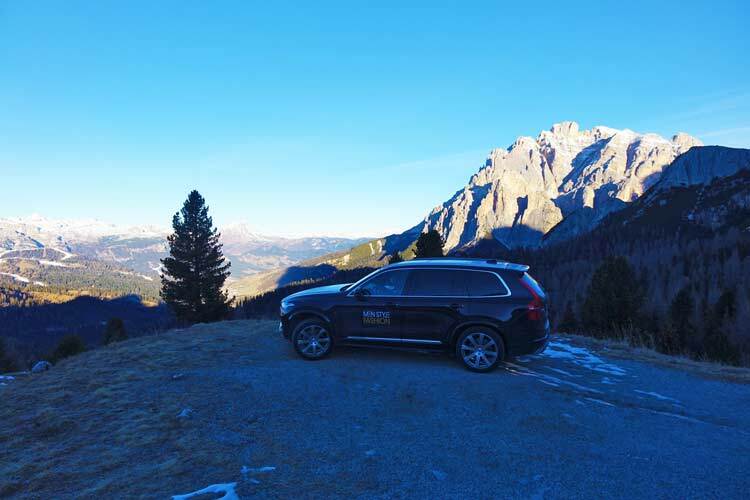 The drive from the airport to Alta Badia was an excellent journey to test drive the XC90. A slow and very narrow climb with lots of small mountain roads, beautiful villages and scenery. On roads like this, the drive can take extra time due to the weather conditions. I came across many drivers who were not so confident when it comes to mountain driving. Therefore the drive was very slow as there is not a lot of space to overtake. So comfort, space and a good sound system can make your journey much more pleasurable. The Volco XC90, ticked all those boxes. This understated SUV was equipped with lots of additional options. The leather seats and it’s options to make sure I was comfortable was brilliant. I am very tall, therefore space and sitting comfort is always a hit and miss in cars. On this occasion, it was a real hit. The moment I sat in it, I knew this was the car for mountain living let alone driving through the snow. The first thing that struck me from the outside was the sheer size of the car. Perfect for my luggage and the bulky, ski equipment. It is almost 5 meters long, not yet Audi Q7 territory but very close. The XC90 is almost 5 meters long. This is a car that can easily handle 7 people. I had the extra seat row folded down and I was impressed with the massive size of the boot, according to the specs it is 1102 litres. The imposing shining grille at the front of the car and the 20 inch alloy wheels gave this car a luxury imposing stance. I felt I was properly prepared to enter the world of luxury skiing and food. After day one, I had other press asking me if we were MenStyleFashion, driving that Volvo. This SUV, really spoke for itself and it was the Battle of the SUV’s up here. 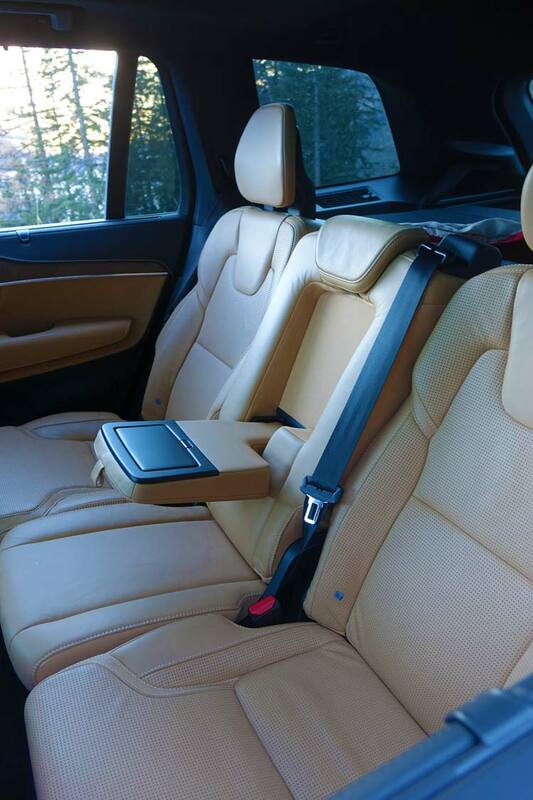 The version I drove had nice brown leather seats which had small perforations in the leather to make it less sticky. The whole interior had a lot of leather including the whole dashboard. This just gave it such a classy feel. 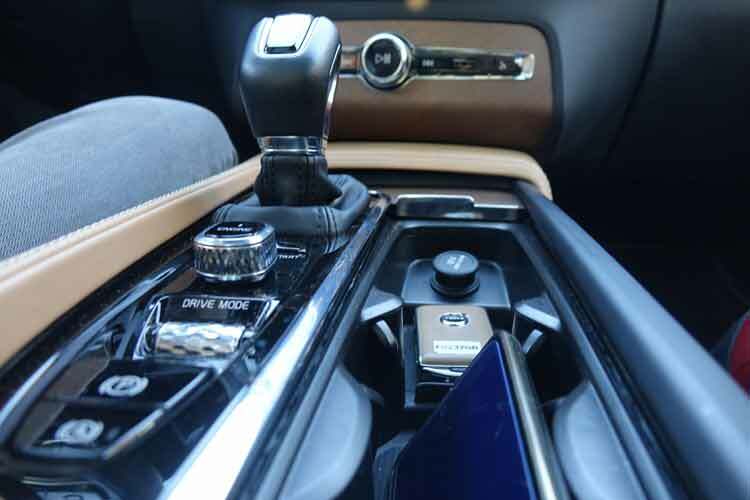 The center console had a 12.3 inch touch screen from where you organise everything in the car, adjusting the seats, music, navigation etc, all very well laid out and very intuitive to use. 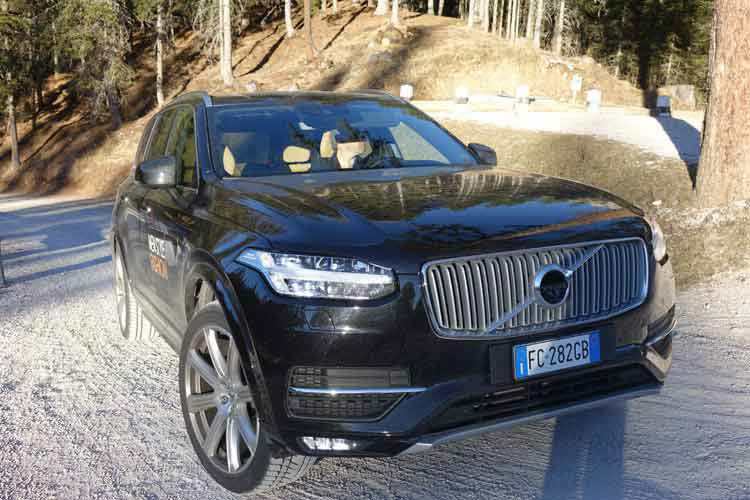 The touchscreen which Volvo calls the Sensus user interface, has a lot of functions like a wireless hotspot and the ability to connect Apple and Android devices among many others. 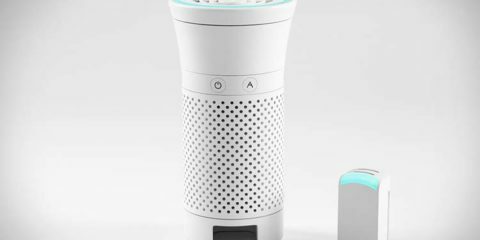 The other option I was eager to try out was the 19 speaker 1400 Watt Bower and Wilkins audio system. It sounded superb car filling with a very powerful bass. It was cold and sunny in Italy so I made sure the heated seats and the heated steering wheel were on. The glass roof was uncovered to enjoy the sunshine and scenery to its maximum. Quality interior, wood inlay at the doors, metallic grill for the Bower & Wilkins speakers, full leather dashboard. The perforated leather rear seats. These seats are also heated. 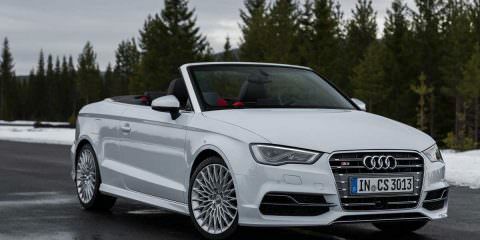 The D5 has a two litre twin turbo diesel engine with 231 Hp and a torque of 470 Nm. I was surprised how quiet and swift accelerating this engine was combined with the smooth 8 speed automatic gearbox. It takes only takes 7.4 seconds from 0 to 60 mph, this for a 4 cylinder Diesel engine and a car that weighs 2 tonnes is impressive. It did not feel under-powered at all. I did miss the sound a 6 or 8 cylinder gives though. After leaving Treviso behind it was time to hit the autostrada. This XC90 is a seriously comfortable cruiser, with the adaptive cruise control and lane keeping system actively keeping the car in the lane. It was a very relaxing drive and I even tried to let the car drive without my hands on the steering wheel, it worked. The heads-up display showed me the speed, GPS directions and also the speed limit, although when wearing sunglasses this becomes a lot harder to see. 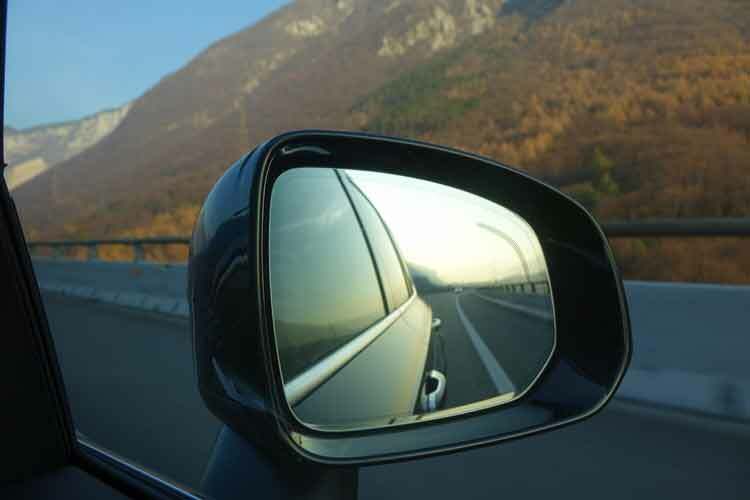 Blind spot warning was another very useful feature on the highway. I left the autostrada behind at the town of Longarone and it was time for 90 minutes of serious mountain driving with small roads and lots of hairpins. I switched the car to the Dynamic drive mode which makes steering more responsive, shock absorption harder, ground clearance lower and the gearbox more sportier. There was still some noticeable body roll and the XC90 is definitely not a Porsche Cayenne or a BMW X5 when it comes to driving these roads. It still did a good job though and the acceleration was swift enough to overtake. I did struggle a bit with the sheer width of the car though, especially when driving through the small towns with narrow roads. 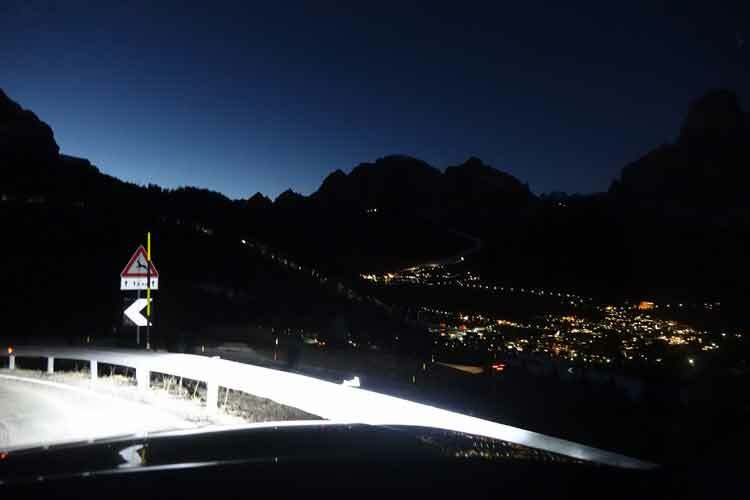 It was getting quiet late and darkness started to set in, I loved the following headlights that followed my steering, it made driving these windy roads in dark very easy too. Mountain driving at its best. Notice the Bower & Wilkins speaker in the centre of the dashboard. The Dashboard was full leather and had a classy feel about it. 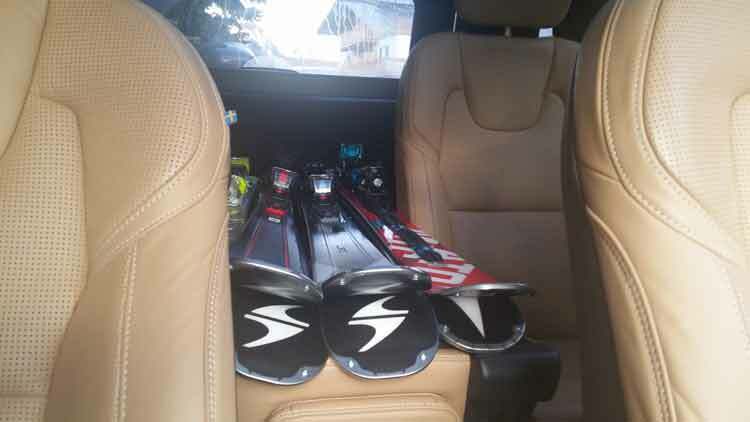 Picking the skis and boots up was easy and with the middle part of the rear seat folded down you can fit even the largest skis in easily. 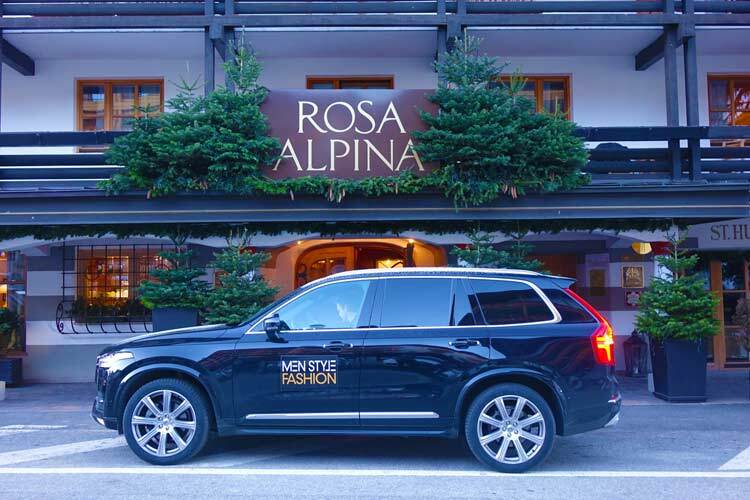 With the MenStyleFashion magnets on the doors I arrived at the Rosa Alpina hotel in San Cassiano. The sheer size of the car made it noticed as soon as I pulled up the XC90 in front of the hotel. The car was the talking point in a positive way for our three day visit. 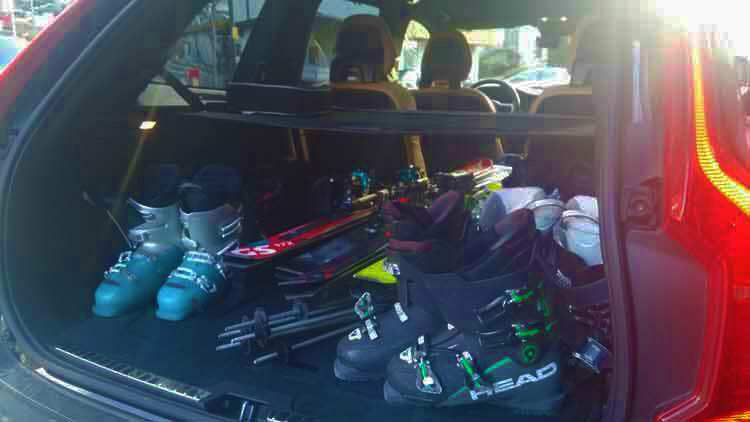 We picked up some extra guest with skis and 4 sets of skis boots and other gear, and it easily fitted in the XC90. 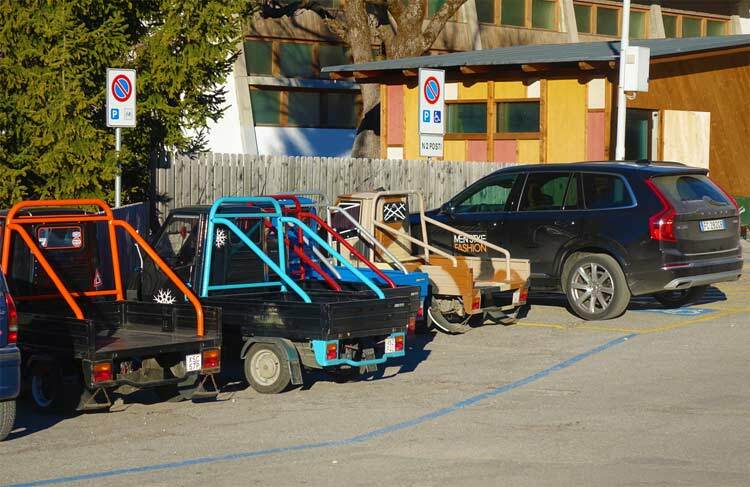 The rear passengers were impressed with their heated rear seats to be driven in comfort to the nearest ski station. 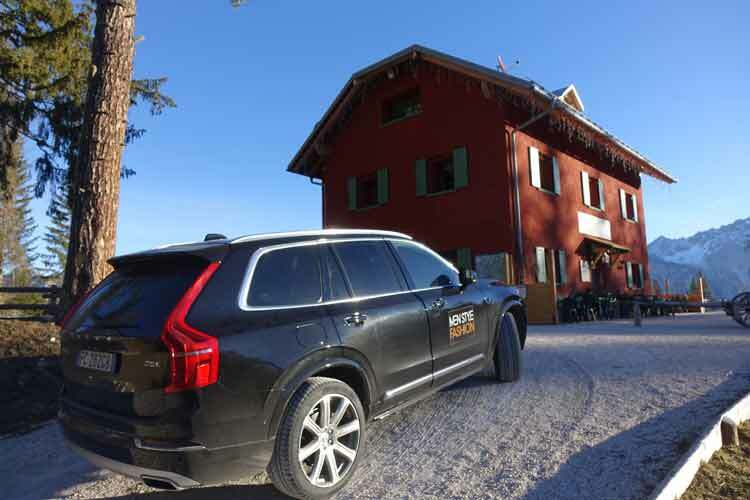 The Gourmet Skisafari was a great success as well as the whole skiing experience in Alta Badia, the Volvo XC90 just matched it well. 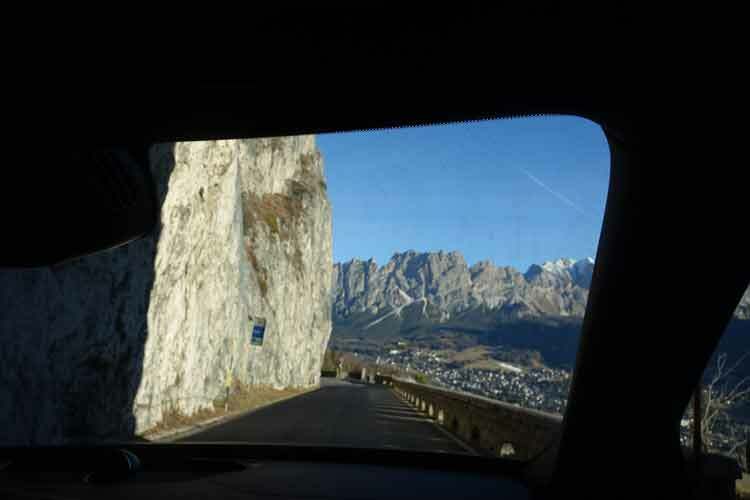 The return road to the airport was different as I took the road via Cortina d’Ampezzo. 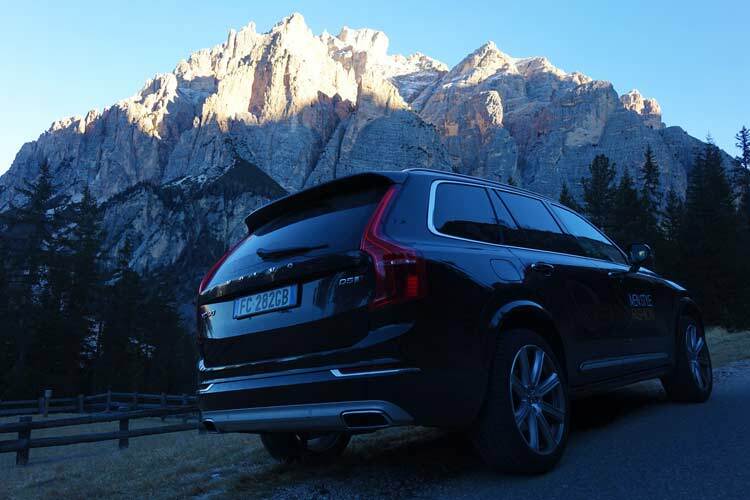 I stopped the XC90 lots of times just to soak up the amazing Dolomites mountain scenery. The two and half hour drive to the airport was again super relaxing, I was sad to leave the car behind. The XC90 is a luxurious SUV with an interior quality to a very high standard. It is a very comfortable highway cruiser and therefor an excellent car to take around your next European skiing trip. The boot can swallow all your luggage and ski gear with ease. For those in the market for a German SUV alternative and want an SUV that looks different and is luxurious, take a look at the Volvo XC90.